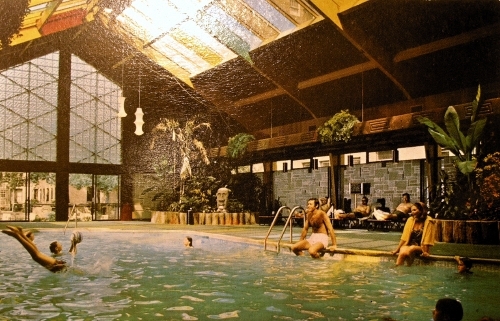 The Curtis Hotel, another Minneapolis hotel lost to time, had a tropical pool worthy of being marketed on a postcard. It was a tropical beach, with palm trees and hanging ferns, right in your hotel. If you look carefully, you will see a Tiki statue hanging out under the palm trees. James Lileks, on his Mpls Long Gone site, has a collection of postcards for the Curtis Hotel, Minneapolis. Found in the Labeled, Postcard, Tiki, and Twin Cities Collections. The Gardens of Kona Hilton Hotel has a resident Tiki statue on the grounds. Found in the Labeled, Postcard, and Tiki Collections. 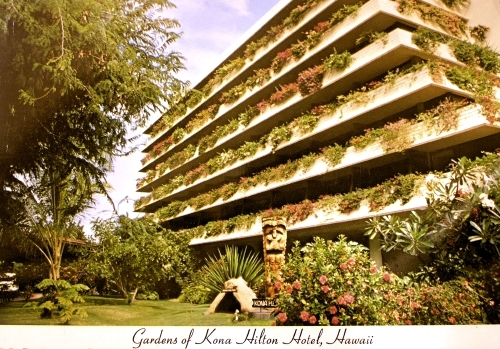 After seeing at this postcard for the Waikiki Room in the now demolished Nicollet Hotel, I wish I could travel back in time to dine at this long lost treasure of Polynesian Pop. The bamboo and rattan furniture, the green vinyl seats, and the bamboo roofs over the tables create an atmosphere of the exotic that is hard to find in modern day restaurants. I can imagine myself sitting on one of those green vinyl chairs and enjoying a Mai Tai while listening to the exotic sounds of Martin Denny. As Hawaiian as the glowing splendor of Diamond Head . . . 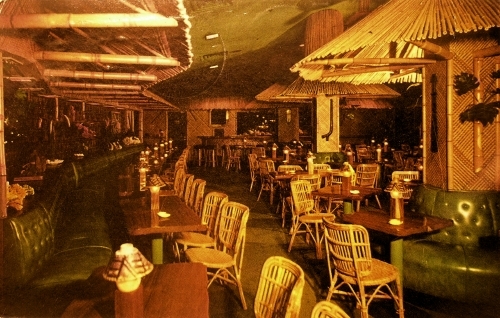 The Waikiki Room’s exciting tropical decor . . . its fabulous Polynesian cuisine and beverages have been imported directly from Hawaii to give you a thrilling new experience in dining pleasure. James Lileks, on his Mpls Long Gone site, has a collection of postcards for the Nicollet Hotel, Minneapolis. Found in the Labeled, Polynesian Pop, Postcard, and Twin Cities Collections.